Our annual Naburn Lock splash and dash meet is over and we have had a far better weekend than the weather forecast predicted. We arrived on Thursday amidst torrential rain, high winds, and black skies - from then on in, the only way was up, and Sunday finished with glorious sunshine! Sadly Thursday/Friday night's high winds put paid to Emma Briggs tent courtesy of a huge rip - CCTV footage may be published on various sites of Emma trying to salvage her tent whilst not really being dressed for the weather........I will say no more! Emma also decided that the tent was too far damaged to stay so went home. Friday evening was a bit too breezy for any flying so we socialised instead. Saturday morning was lovely, and it was flyable - bit a little quick, although not for Adam TooManyNames to take to the sky in his 120. Nice safe landing later and home for breakfast. Saturday evening also gave us all a great flight with Alex Braund Smith and pu/t Daniel King off in G-OATV, a committee of pilots (John Russon, Derek Grimshaw and Neil Hepworth) in John's gorgeous G-SCFC, another committee of pilots; Tim Wilkinson and Linda C-Clarke in Tim's Sackville G-CIWW, yet another committee of pilots; Adam TMN and Martin Read, flown by Pu/t - Emily Read in Adam's G-BZBL, and finally Mike and Michelle Bellamy (Taylor) in G-BVDB. 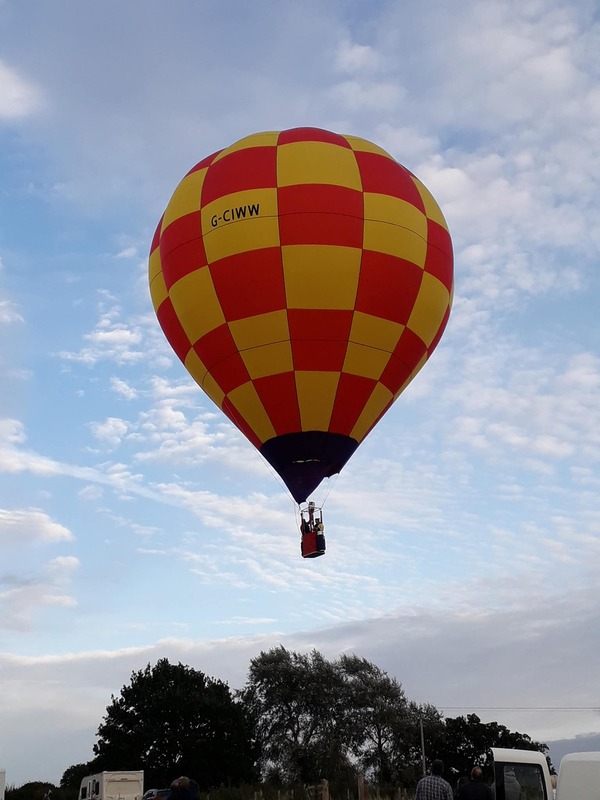 Mary Bellamy had a bit of a difficult retrieve as she lost everything including her phone charger, and the balloon, so realised the best thing to do was to return to the camp site for a charger and two strong men (well played Mary!) to help carry out over the two locked gates. Everyone came home safe and sound which was the best result. There was also evidence provided that John Russon and co. managed the elusive splash and dash so we had to try and come up with new rules to exclude his attempt in the hope we could keep the trophy in Yorkshire! We had a mass food frenzy/faith supper with curry and all the trimmings in the Braund Smith awning and finished off with a huge Millie's Cookie with the club initials courtesy of the Barclay Faulkner family - yummy, and thank you! The best bit of the weekend has got to go to meeting the three new 'members' - Ollie and Luna, who are Sal and Andy Billany's Sheepdog puppies, and Willow, Kath and Derek Grimshaw's Cavapoo. Thank you everyone for coming along and here's to the next PRBA meet at Thornton le Dale in a fortnight's time.